It might seem a little early to you, but trust us, we did the math: It isn't. 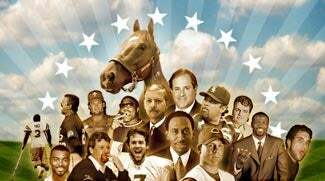 It's time to start taking nominations for the 2007 Sportshuman Of The Year. You should have seen this coming when the ads for Santa Claus movies started popping up. Last year's winner, of course, was the great Barbaro, though he was forced to abdicate his throne. (Because he died. You see.) Who will this year's winner be? We shiver in anticipation, and because it's cold. The voting itself will begin a week from today, but we ask for your nominations for the 16-human bracket. We have a few thoughts on potential nominees ourselves, but we ask, first, for yours. And yep: It gets later earlier, every year.